Lamplight Owner Nina Koloseike Moore presents Jennifer Alfano and Me Again with the prize for the $5,000 USHJA National Hunter Derby. 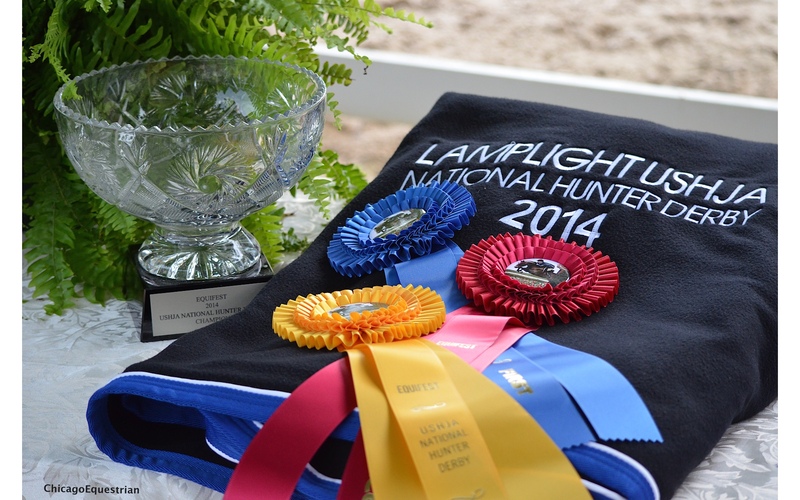 Wayne, IL – July 25, 2014 – Today’s highlight at Lamplight Equestrian Center’s Equifest I was the $5,000 USHJA National Hunter Derby in the Wisconsin Equine Hunter Ring. The derby course, designed by Kevin Giblin, was a combination of long run singles paired with galloping bending lines. Thirty-eight entries tried their luck for a chance to return for the handy round as one of the top twelve. Judges Shane George, Sandra Brown and Holly Orlando made the final decisions. The handy round began with a long gallop to the far end of the ring to a single jump, then to a bending line, a rollback, a trot jump bending out over an oxer, finishing over the natural two stride. The top twelve of the class demonstrated their handiness over the galloping track with several turn options in the rollback. Jennifer Alfano and Helen Lenahan's Me Again. Keeping the lead for the entire class was Jennifer Alfano of Buffalo, NY on Helen Lenahan’s Me Again. Alfano is no stranger to the winner’s circle when it comes to derbies. Alfano and Jersey Boy are icons in the International Hunter Derby world and winners of the 2012 International Hunter Derby Finals. 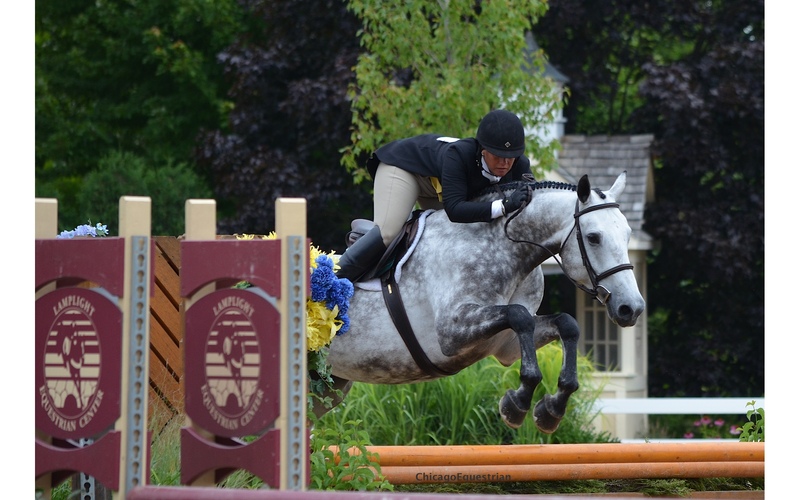 She is one of the top leading hunter riders in the money won category earning almost $775,000 in lifetime winnings. The 2008 grey, Dutch Warmblood, gelding, Me Again, will be turning six in October. 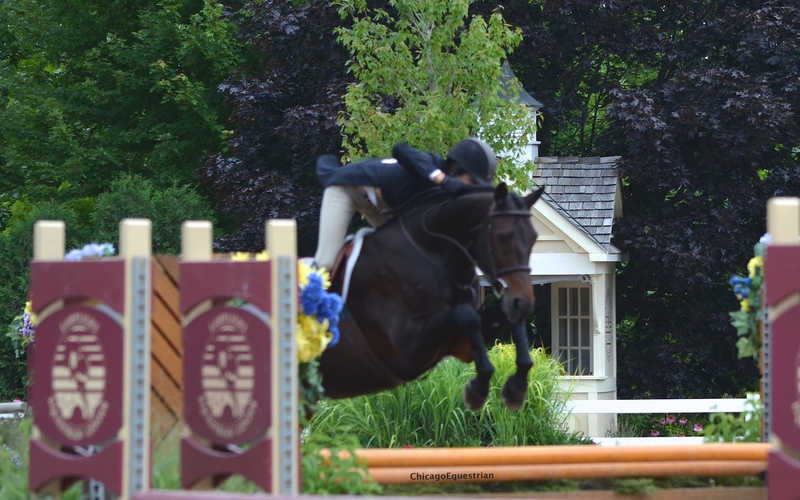 Alfano has had the horse almost two years and set the pace early in the class earning a 92. In the handy, Alfano could not be beat scoring and 88 plus three for the high options and an overall total of 183. Tiffany Hammack rode Lance Williamson's AARHUS to the second place prize. Holding the second place spot throughout the class was Tiffany Hammack and Lance Williamson’s AARHUS. 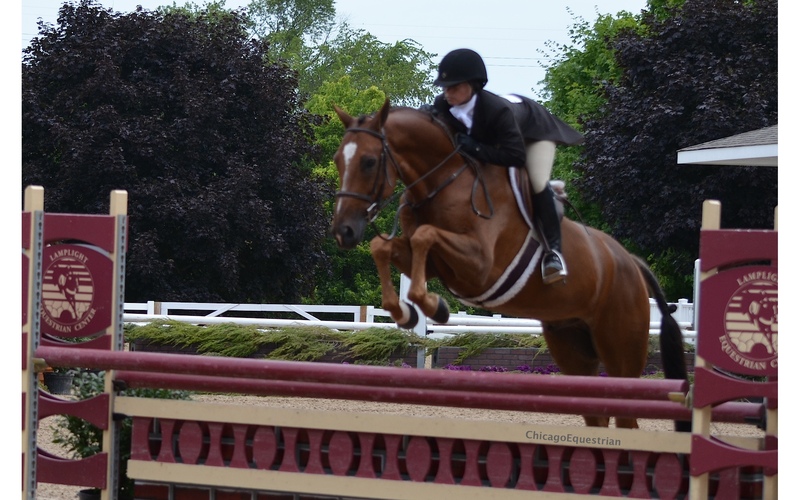 The seven-year-old horse was recently imported and was showing in the jumper division. 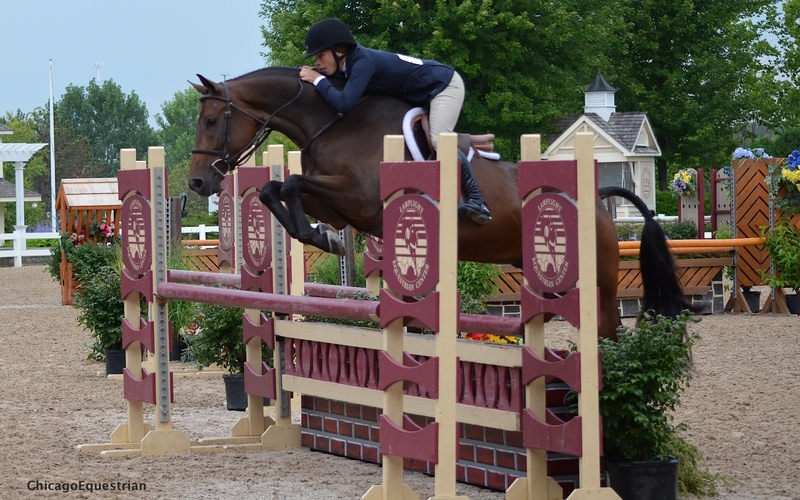 Just last week, Williamson of Gurnee, IL, made the decision to try the horse in the hunter ring. Hammack won two of the 3’3” Performance Hunter classes with him and was Reserve Champion so they figured, why not try the derby? Hammack earned a first round score of 90 and gave it their all in the handy round. Jumping all the high options and making economical turns as Hammack is known for in the jumper ring, landed the pair an 85 plus four high options and an overall total of 179 for second. Rachel Johnson and Chrisma finished in third place. Also holding her third place spot for the entire class was Rachel Johnson of Gurnee, IL, on Mary Loeber’s Chrisma. Johnson received a first round score of 89 and a second round score of 84 plus four high options for a total of 177. Johnson was Champion on the eight-year-old Westphalian mare in the Performance Working Hunters 3'3" earlier in the week. Stefanie Collier and My BFF took the fourth place spot overall. Moving up three spots with a stellar handy round was Stephanie Collier from Sheridan, IN and Erin Cummins’ horse, My BFF. They were best friends today as Collier earned an 85 in the first round and an 85 plus all four high options in the second round for a total of 174 for the fourth place prize.